Back by popular demand, this is an old post that I wrote last year and never got around to uploading. Hope you enjoy reading it. At the start of fall break in 2015, my mom and I were stuck in the house for two days because of the haze that was surrounding Kuala Lumpur. Haze is poisonous fog that comes from Sumatra, Indonesia where they burn palm trees, and the fog travels to Kuala Lumpur. On Wednesday we finally escaped to Bali, Indonesia. It was very exciting to go to sunny Bali, and especially nice to get away from the horrid haze in Kuala Lumpur. When I awoke from my slumber in Bali, the sun was shining and the flowers were blooming. As we made our way down stairs at 8:00 in the morning, my mom told me we were heading out to go to an Elephant Park that gives rides to people. The car ride to the Elephant Park was amazing. We saw interesting Balinese houses and tall statues of Hindu Gods that were all over Bali. The park was all the way back into the jungle. I was so, so ecstatic and nervous about the elephant ride but I was also afraid that they would drop us on the jungle floor. 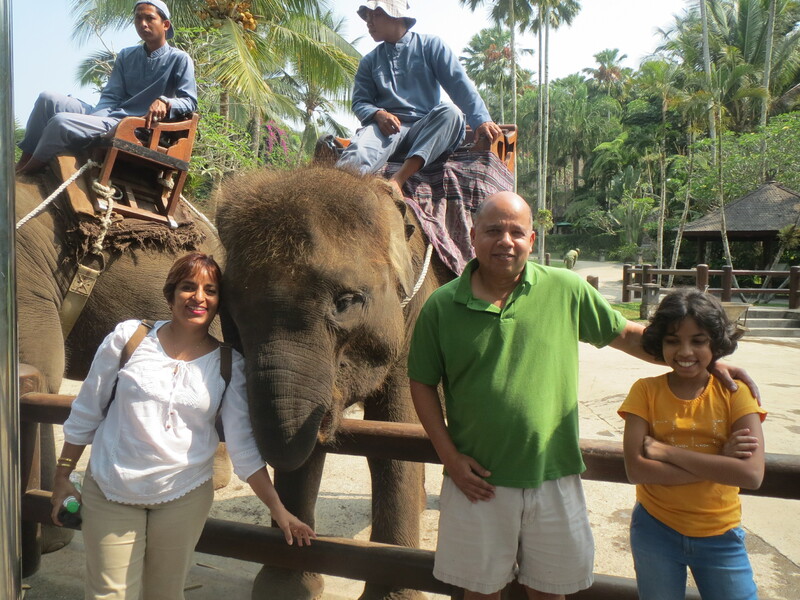 While we waited our turn to ride, we fed the elephants bamboo and palm fronds. We met one elephant who was named Lady Gaga. She was a really big showoff and showed all of her moves by painting with her trunk and jumping up on to the sidewalk. Finally they called our names for the elephant ride. We climbed on the elephants back, careful not to slip and fall. The elephant feeding station was a blast! The elephant’s mahout or tamer said the elephant’s name was Devi. She kept tugging at the branches with her trunk because she was so hungry. Once she pulled so hard that we almost landed up on the ground!! I screamed very loud! Luckily, the tamer got her back on track and we started to head towards the honeymoon spot for elephants where the captive elephants are bred. We learned that the elephants are rescued from Sumatra and brought to Bali because of all the burning of the palm trees, which is destroying their homes. These are the luckiest elephants ever because they are safe, get to eat good food and meet new people every day. Devi went into the water to cool down from the blazing hot sun. After that, the ride ended and we got off so that another family could get on to her. That same evening, we traveled to a temple called Uluwatu on the top of a beautiful cliff with waves crashing below us. At sunset we watched a performance called the Kechak dance. The Kechak dance is based on a story from the Hindu epic book Ramayana. The dance was very exciting – the only music was a group of guys saying “Kechak-kechak’ over and over again in various rhythms. They kept it up for a whole hour!! The dancers used moves to express emotions through the whole plot. When Hanuman the Monkey God came up on the stage he acted like a real monkey, scratching himself and leaping through the audience! It was so surreal! It was so amazing that everyone gave him a standing ovation. The following day was full of adventure. First we went to another dance it was called the Barong Dance. In my opinion the Kechak dance is much better than the Barong Dance. It was very weird and inappropriate, even more inappropriate than the musical Oklahoma, which I saw in Austin. Never take your five year old child to the Barong Dance, they will be confused and baffled about what is happening. The Barong Dance depicted a folk tale and was a story about good and evil spirits. It had a confusing plot which was hard to follow, but everyone seemed to be having a good time. After the Barong Dance, we hopped into the car and drove off to the Luwak coffee plantation. Luwak Coffee isn’t your average Starbucks. Basically, Indonesians feed partly digested coffee beans to civet cats. The civet cats eat the Luwak coffee beans and poop them out. This sort of coffee is thought to have a better flavour than other kinds of coffee, and is very expensive. When we visited the coffee plantation, the lady who worked at the plantation gave us a tour of all the coffee and spices they grew in the plantation. They even let us grind the coffee, by pounding the Luwak coffee beans with a stick. We taste tested different kinds of coffee and tea. Some were fantastic, but some of them were a “meh” like the Luwak coffee, even though it is very expensive. We bought coffee and gifts for our family. I was getting so hungry that my stomach could have eaten my own flesh. The driver took us up to Kintamani, which is an active volcano that erupted in 1968, and burned the valleys of Bali with lava. The volcano is still active today. We ate our lunch and took pictures of the ruins and the volcano. We jumped back into the car and slept soundly until “Screech!”, went the car, waking us up. We had reached our destination, the Tegalalang Rice paddy fields! The rice paddy fields are cut into the hills by farmers and were filled with mud and rice. It was so steep that we had to be careful where we stepped. The Tegalalang rice fields are terraced paddy fields cut into the hills. I loved our trip to Bali and I would like to go back there again. Thanks, Adela! Wish you were with us too! Hi Leah! I was so excited to see you have a blog! Your trip sounds wonderful and your descriptions and photos are fantastic. Thanks for sharing!